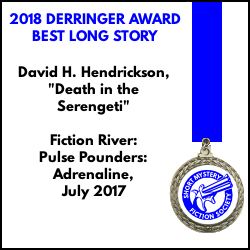 “Death in the Serengeti” has been named winner of the 2018 Derringer Award in the Best Long Story category! One of my first dreams as a writer was to win a Best Story award, so this honor is a dream come true! The Short Mystery Fiction Society presents the Derringer Awards at Bouchercon, the World Mystery Convention, held this year in St. Petersburg, Florida. “Death in the Serengeti” first appeared in Fiction River: Pulsepounders: Adrenaline. Another Fiction River story of mine, “The Kids Keep Coming,” was also a Derringer finalist, finishing as a runner-up in the Best Story category.